"This house believes that the term 'Fartown' should be dropped and that the phrase 'Huddersfield Giants' is the only one which should be used by supporters". To Fartown or not to Fartown, that was the question! Chairman Dave Calverley opened the great debate by asking members to vote at the conclusion based on the arguments proffered and not what was in their hearts. If it were to be solely on 'hearts' then there would have been no point in the debate. He understood the heritage of the club â€“ ably demonstrated by the current Heritage Project â€“ and what the ground meant to supporters past and present. However, as a marketer, he saw the necessity of getting the 'Giants' brand out and well ensconced in the public's mind. "The name 'Fartown' is not known outside of the Huddersfield area" he continued, "and as such, it is the word 'Giants' which both the club and the community of current supporters ought to be driving forward." Supporter Alan Hobson gave an inspiring and passionate [note the unbiased reporting here] defence of 'Fartown' by stating that the word was both a nickname and a moniker. 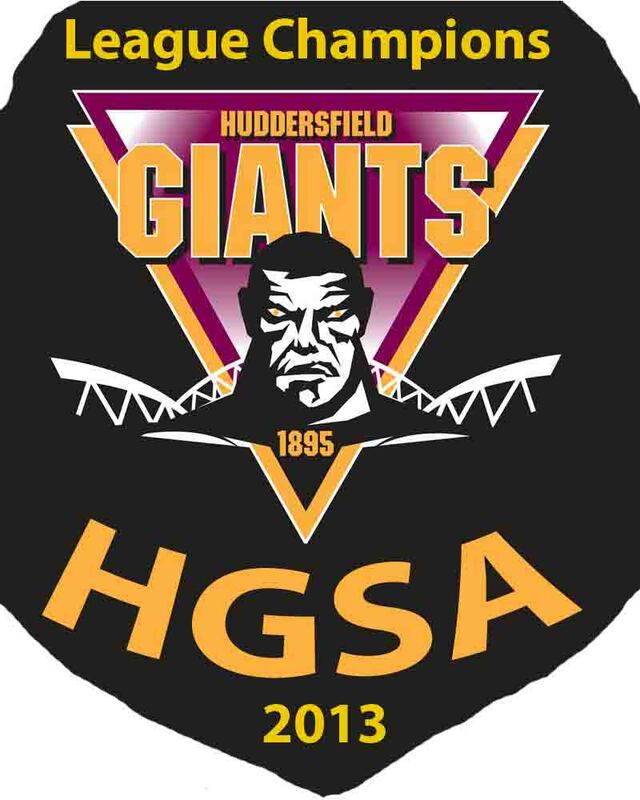 "Huddersfield Rugby League Club and the Giants are both recent concepts. Even when the club was officially 'Huddersfield Cricket and Athletic Club', local buses had flyers stating 'Football at Fartown' in their windows. This one word states who we are and what we do." HGSA secretary Julie Thwaites spoke by backing Stuart's attack by reiterating the salient points of his argument. "'Fartown' confuses not only away fans, but I also find younger supporters asking 'who is this Fartown?'. We look up to the Giants, we look up to Big G."
It then fell to the club's Deputy Chairman Paul Morgan â€“ a man whom you expect to back 'Giants' to the hilt â€“ to conclude for the defence. "We can't vote with the head, we have to vote with our hearts. The hackers we're enjoying at the World Cup wouldn't exist in a Bleesian world, they are a remnant of the past, of each country's heritage. "Fartowners wanted to innovate and move the game of Rugby forward. "Harold Wagstaffe, a star of the Rourkes Drift Test, called himself a Fartowner. Dave Valentine, the first British captain to hold up the World Cup, called himself a Fartowner. "'Fartown' gives us our sense of history, and as such must be retained." The audience was equally passionate in the comments and questions which followed. What was particularly interesting was the way people did speak from their heads and not just from their hearts. After the final summing up from both sides, the vote was taken. And extremely surprising was result. The motion was neither carried nor defeated! At this point, Alan proposed an amendment to the motion: "This house believes that 'Fartown' should be vigorously remembered and continued to be used, but that 'Giants' is the way forward in marketing the club". The Annual General Meeting was a tremendous success. We had more members present than ever before and more committee nominations than ever before. Perhaps this was due to the fact that we had more food than ever before [OK, we've never provided food previously!]? Or perhaps members turned up to see and hear Captain Fantastic! Yes, Rugby League's Man Of Steel, Danny Brough, was our guest. For the second year in succession, he was presented with HGSA's prestigious Wagstaff Trophy â€“ the person whom members least wanted to leave the Giants. Danny was handed the trophy by one of his biggest fans, Tyler Broscombe. He then proceeded to answer questions from the floor in his own imitable and forthright way â€“ Danny is not afraid to air his opinions! Earlier on this year, the child of a friend of Jenna's was diagnosed with leukaemia and was receiving help from a Hull-based charity called 'Life For A Kid'. After much thought about how she could help, she came up with the idea of a sponsored climb up Ben Nevis. The idea mushroomed and Jenna contacted all the other Super League clubs to see if any other wives and girlfriends would take part. The upshot was that almost 100 WAGS [a much maligned term, but which Jenna thought would attract the media's attention] signed up. Even though only 70 actually turned up for the event, £30 000 was raised for Life For A Kid. The girls recounted many tales of their exploits. How they had to sleep in dormitories, each with 12 beds. When her friends wouldn't stop talking, School Marm Lindsay told them in no uncertain terms "SHUT UP"! The WAGS from one particularly SL Club were constantly throwing tantrums. Who were they? All I am allowed to say is 'which club does Lindsay's brother-in-law play for?'. Jenna took a ball up to the top. The intention being that she kicked it for Lindsay to catch it. You'll never guess what happened! Yes, the wind got hold of it. Honest. Questions followed about their life at the Giants. They all agreed that Paul Anderson deserves a tremendous amount of credit not just for the on-field play, but for making the club a close-knit group of friends. Previously the wives sat in separate boxes with their families. Now Paul has them sitting together in the stands. This, together with other joint activities, has resulted in them bonding together, making lifetime friendships. The photographs of Jenna, Lindsay, and Laura serve to demonstrate what a fun-filled evening we had and sum up the atmosphere these days at our great club. At the end of the meeting a collection was held for the charity and they were each given their Honorary Membership certificates. Thank you girls for a truly wonderful evening. At half time during the Wigan match, Paul Hulin represented the Association and presented Ken Davy with a cheque for £500. As with all the money we raise, this will go towards the developent of the youth at the Giants. Dave Calverley & Brendan Callaghan were asked by the BBC to be interviewed for the SL Show. This took place in the visitors' dressing room at the John Smith's Stadium. How often does a politician speak without being political? Well, we managed it last week when Jason McCartney, MP for the Colne Valley, was our guest speaker. Jason is a member of the All Party Parliamentary Rugby League Group. The aim of this influential body is to act as ambassadors for the game and promote it at all levels. Whilst it does mainly consist of MPs from the North, it is truly cross-party, with luminaries such as Labourâ€™s Lindsay Hoyle, the Deputy Speaker, and his father Doug [from the House Of Lords] and Greg Mulholland from the Liberal Democrats. The former two are fervent Warrington supporters, whilst the latter is a Leeds fan. There are approximately 40 members in the group but, just to put it into perspective, there are over 400 such groups in Parliament. However, they recently had Nigel Wood [Chief Executive of the RFL] explain the proposed 2015 league structure [for those who say that it is too complicated, Jason agrees strongly with you!]. When Parliament reopens in September, they have set up a Rugby League Extravaganza with the World Cup in prominence. In addition, Jason regularly promotes the sport with David Cameron. Jason recognises that there are numerous challenges in our game [funding, television rights, crowds, growth - should we be an M62 corridor sport or should we continue to rise as a world sport?] and asked the audience to join in a discussion about what we, the grass rootsâ€™ fans, want. A lively debate ensued but thankfully everyone remained friends! All in all a good night was had by everyone. Mick thanked Jason for his time [as a Town season ticket holder, he missed a match that night!] and enthusiasm. Dave presented him with the customary Honorary Membership of the Association. Pat Tayor being presented with the Giant Hamper, her prize for her winning entry in the Giant Teaser quiz. July saw Trevor Kaye as our guest. Trevor has been supporting Fartown and the Giants for 67 years now, and what stories did he tell! Here are some of the more publishable! His earliest recollection was in 1951, and the early 50s’ tries on Lionel Cooper. As the 60s wore on, the decline set in with lower crowds and the inevitable decline in income. The club in those days was run by a royal ‘committee’ with various other ‘committees’ subservient to it. Trevor and 5 others decided to form yet another, the ‘New Players For Fartown’ committee. They instigated an old newspaper collection, being paid £300 per wagon load - a substantial sum in those days. For those who remember, the stand at Fartown was wooden. The newspapers were stored beneath it. Eventually someone realised that this might be a fire hazard! Newspaper collecting ceased. Batley Variety Club, the one of the country’s leading venues for star acts, agreed to let the club have Monday nights free of charge. The club kept the ticket receipts and BVC had a good profit from bar takings. Eventually Trevor decided to stand for election to the General Committee. Here he hoped he could transform the running of Fartown. Instead, at his first meeting, he was told in no uncertain terms by a long-established committee member, Stanley Rockett, “Right lad, the best thing you can do is sit down and shut up for a year”! Around that time, Ken Senior, Dave Hepplestone, and Bob Tomlinson were prominent members of the team. Trevor helped organise their testimonials. The coach was Brian Smith. Not the world’s best, but he instilled a tremendous team spirit amongst the players. However, come team selection after Thursday night’s training, the coach would be told “Right Brian, off you go now. We’ll [the ‘Football Committee’] pick the team.”. We’ve all seen how today'sÂ team spends almost half an hour warming up before the match. Well, it was the same in those days. For example, on away trips to Cumbria, the coach would stop a mile outside of the town and the players had to walk to the ground. Almost half an hour’s pre-match warm up! As finances deteriorated, the kit got worse until the club ended up with only one set. If the A team [the reserves] had a match on a Saturday, it was all hands to the team bath in order to wash the kit ready for Sunday’s first team game. The club reached the semi-final of BBC’s Floodlight Trophy. There were only 14 shirts for 15 players. A white shirt was acquired and a couple of wives sewed a claret & gold V on the front. 1973/4 saw the team win the 2nd Division. So what did the ‘committee’ do? They sacked Brian Smith! Roy Brook and Colin Wood took over and turned the club into a limited company. Maurice Bamford was appointed coach. A, let’s say, difficult man to deal with! Then a stroke of luck. Umbro were looking to expand their sponsorship. They were persuaded that Fartown were a good prospect. The company provided full kits and training gear for 5 years â€“ virtually saving the club. Trevor gradually faded away from his beloved team as a result of joining Radio Leeds’ sports team. Harry Gration phoned Trevor and told him “It won’t be commentating on Fartown, you know”. For those with long memories, you will not need reminding of the pleasures of Huyton! After every game, anything and everything that could be moved was locked up inside the club. Trevor had to commentate on one incident during the game where a youngster rode his bike along the 25 yard line during a game! Trevor was Radio Leeds' commentator at the first Sky match - Paris St Germain v Sheffield Eagles in 1996. He arrived in Paris but did not know where the ground was. He could not get through to Radio Leeds and people in Paris denied that there was a Rugby League ground in Paris! Thankfully he did manage to find the ground. Trevor’s last commentary was that memorable occasion at Old Trafford when we beat Hull to gain promotion to Super League. 20 years of hugely enjoyable commentating had come to an end. Trevor could once again watch his favourite team. Trevor’s journey has always been accompanied by Sheila, his wife. Ever the quiet one [Trevor wishes! ], we must get her side of the story one day! At half time during the Leeds match, Mick Beevers represented the Association and presented Ken Davy with a cheque for £250. As with all the money we raise, this will go towards the developent of the youth at the Giants. Tim Jones the U16s Scholarship coach went on to answer. Sam’s Team is not just about the playing side of the game, but the youngsters have to select the players, coaches, support staff,Â media staff, promotion of the event, and even designing of the kit!!!! Therefore showing other avenues within sport if they cannot perform. Tim then went on “I have a similar programme running at Moorend Academy. I work with 11 year 9 students using sport again as a powerful tool to re-engage them to the importance of school, good behaviour, and respect. Tim can be contacted for sports coaching, conditioning, or general questions at tim.jones3@sky.com. For those who can't quite remember it from the meeting, Paul is a Cas lad - and obviously very proud of the fact considering the number of times he reminded us of it! He thoroughly enjoyed playing rugby as a lad, so much so that he carried on playing after being told by Castleford that he'd "never become an international"! This inspired Paul to seek employment elsewhere, ending up at Leeds. Here he suggested to the club ought to do something about his paltry wages. They did. He was transferred to Halifax! It was not too long, however, Brian Noble at Bradford decided that Paul was the type of player to keep Bradford at the top of the Super League tree. However, life at the Bulls was not what Paul expected. Instead of simply going on to the field and playing rugby, for the first time in his life he was being told how to play the game. He was being coached for the first time! After200 games in 8 years, St Helens signed Paul and success continnued. After 2 years, Paul decided to retire from playing the game, and Jon Sharp persuaded him to join him as a coach at the Giants, where he is now in his 7th year. The 14th Yellow Player for Warrington had every right to be on the pitch last week. The rules state that a coach can go onto the pitch to infrom a player that he is about to be substituted, and can stay there for 3 plays of the ball. However, he does not agree with this, and always tells Chris Thorman to get off immediately. One of the things which Paul aims to do is to get coaches to understand what referees want and, in return, for referees to understand how coahces work. To this end, he had the top brass of the refereeing fraternity down at the stadium 'today'. He is infavour of a 12 team Super League with promotion and relegation reinstated. "There just aren't enough quality players to sustain 14 teams". "Bring back the plate competition in the Challenge Cup. That way teams knocked out in the 4th round would still have the opportunity of playing at Wembley." This would add a few more thousand to the crowd and, hopefully, fill the stadium. Paul's philosophy is to not overcoach players. Set plays have there place, but let the players out on the pitch decide what's best in the situations they find themselves in. There were many more questions from the floor, too numerous to mention [remember would be a better word!]. At the end of a tremendous evening, Mick thanked Paul for his insights into the game. Dave then presented hm with the now traditional HGSA Honorary Membership. Jonathan was born and brought up in Horsforth. When he was 7, his Dad moved his business to Headingley - highly convenient for him to take Janathan to watch both Leeds Rhinos and Yorkshire Cricket. This introduction to sort determined Jonathan to become involved in some way. He loved to mimic commentators such as David Coleman, John Motson, Eddie Waring, and Michael O'Hehir and had a burning ambition to commentate on the Grand National or a Wembley final. Discouraged from a career in broadcasting and journalism at school, he ended up having a successful career in financial services for over 11 years, during which time he spent weekends and evenings continuing to play and watch sport. Then, when redundancy hit at the building society for whom he worked in 1998, he took advice from friends Sid Waddell (the late, great darts commentator) and his wife Irene, and was encouraged by both to pursue that long-held media dream. Jonathan's career change entailed studying for a degree as a mature student, taking a joint honours degree in Media / Sport, Health & Leisure at Leeds Trinity University College. He graduated in 2001 with a first. His broadcasting career began at Leeds Hospital Radio before moving to Radio Leeds, where he was offered weekend work reporting on Rugby League and football. He was so good that he became a regular member of the sports department, producing the Night Sport programme for John Boyd in addition to presenting sports bulletins. Having presented Sky's "Sportslive" sports betting radio show as a freelance for some years, Jonathan was then contracted full-time by the company from 2008-2012. During that period, he was the voice of Rugby League for the station, while also commentating on Test cricket, football, rugby union, and both horse and greyhound racing. In 2012, Jonathan returned to freelancing, although continued to work for Sky both on TV and radio, appearing in-vision as a regular Rugby League reporter and also broadcasting on cricket. He also made his debut as commentator on Premier Sports in February 2013, when Whitehaven were defeated by Leigh in rugby league's Kingstone Press Championship. During the course of the evening, Trevor Kaye asked Jonathan a question and, without turning to look, Jonathan immediately said "Trevor, good to hear you again". He had remembered the sound of Trevor's voice from Trevor's days as a Rugby League commentator for Radio Leeds! At the end of a highly informative question and asnwer session, Mick thanked Jonathan and Dave presented him with his Honorary Membership certificate. At half time during the Widnes match, Brendon and Margaret Callaghan represented the Association and presented Ken Davy with a cheque for £250. As with all the money we raise, this will go towards the developent of the youth at the Giants. The event was organised as a joint venture between the Supporters Association and the Giants. And to say that it was popular is a huge understatement! Radio Leeds' James Deighton put the audiences searching questions to the panel. And the answers given by Richard Thewlis, Danny Brough, Chris Thorman, and Martyn Sadler [editor of League Express] were equally forthright! In fact, Martyn was told "And don't print that!" on quite a few occasions. Chris revealed that he could have carried on playing in Super League, but did not want to uproot his family, so he chose a career in coaching instead. From being the chief cook and bottle washer in the lower divisions, he now can apply himself full time to coaching. Danny was given the opportunity to express his views on referees and Steve McNamara. We can give his answer to Oliver, who asked how much training he did â€“ lots of fitness and weights work. Martyn's suggestions about how to promote both the game and individual players were well-conceived but would take quite a bit of what the Rugby League does not have a lot of â€“ money. The Bradley Wiggins/Sam Tomkins advert is an excellent way forward. We need to ask more sporting heroes to talk about our game. Attracting more rich people to buy clubs is another ideal. Richard, a supporter of Fartown long before he worked for the Giants, fielded questions about the running of the club extremely truthfully. In particular, he berated the negative rumour-mongerers in the fan-base. The comments made by these people are often disruptive and are never helpful. He has an ever-open door for people check their facts before airing them in public. As is now traditional at a Supporters meeting, Dave Calverley presented the guests with their Honorary Supporters Association Membership Certificate. This entitles guests to attend meetings for free â€“ but if they want to vote they have to pay their Â£5! So, an extremely successful meeting. Apologies for not relating some of the more, shall we say, controversial points, but the laws of libel are quite a deterrent! We hope to arrange a similar event towards the end of the season when you will be able to hear the warts and all answers for yourself. Our February meeting was supposed to have been Maurice Oldroyd, founder of BARLA. He managed to avoid appearing by opting instead for a hip replacement! We hope you are progressing well, Maurice. His substitute was the club’s MD, Richard Thewlis. Richard, however, chose to have flu instead. Thankfully Paul Morgan, Deputy Chairman, managed to stay fit and healthy for the occasion. Not that you were 3rd choice, Paul, we were going to invite you at some stage! Paul gave us a behind the scenes insight into what happens at Boardroom level. And quite fascinating it was. Once Paul let it be known that he is a sports psychologist, he was inundated with questions about how the team could avoid its trademark end-of-season slump. He told about various ‘tricks’ which individual players could use to ‘snap out of’ poor play, but the main answer was that we have a different set up now. Baloo [coach Paul Anderson] is in charge! It was confirmed at the meeting that our new man-mountain, Ukuma Ta’ai, had arrived. On the flight over, Ukuma found it extremely uncomfortable in the aeroplane’s seat. Consequently when he wanted to sleep he lay down in the aisle. When asked if Ukuma was asked to move, Paul replied “Well, would you ask him?”! We Giants people are used to both these concepts â€“ although recently it’s been in the form of ‘Good Half Season, Bad Half Season’! Anyway, this was the theme chosen by our latest guest, Danny Lockwood of the League Weekly. It is excellent news thatÂ RL has a superb trade press, League weekly is solvent, it looks like Salford will be saved, and the game has people like Ken Davy. Whilst a lot of clubs do have serious benefactors, others thought they had and discovered the opposite to their cost! The economics of sport is that it is in a dire situation. Not just our beloved game, but all sports. However, comparing League to Union, we are in comparatively safe hands. These days, Union is not our main competitor, it is the NRL over in Australasia. They have just negotiated a £670 million deal over 5 years. That is £134 million each year. Compare that to our Sky deal of £90 million â€“ over 5 years! Let’s keep it to ourselves, but this means that the NRL can afford anyone whom they choose! RLWC 2013 [the Rugby League World Cup 2013] will be a success â€“ unfortunately we’re not going to win it! How can we compete with all the resources that New Zealand & Australia have? True, they do not have the almost perfect half back like we [England] do in Danny Brough, but, sadly, it looks like we will not play him either! Danny [Lockwood] proved to be an excellent and entertaining guest. It has been judged sensible to not relate all that he told us! So, as Mick Beevers said at the end of the night, “Thank you Danny, and here is your HGSA honorary membership certificate”.